Part Used & Method for Pharmaceutical Preparations: The aerial parts of the plant are harvested either in summer or autumn, with autumn being preferable. They are cut into pieces and dried in the sun. Properties & Taste: Pungent and neutral. 1. Dampness blocking spleen and stomach manifested as epigastric and abdominal distension and fullness, nausea, vomiting and poor appetite. Eupatorium (Peilan) is used with Agastache (Huoxiang), Atractylodes rhizome (Cangzhu), Magnolia bark (Houpo) and Round cardamom seed (Baidoukou). 2. Invasion by exogenous summer-heat and dampness or early stage of damp-heat febrile diseases manifested as stifling sensation in the chest, absence of hunger, low-grade fever and sallow complexion. 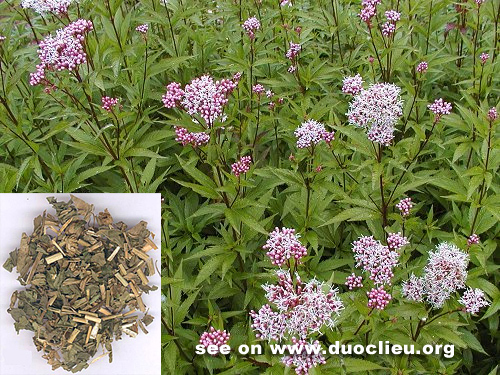 Eupatorium (Peilan) is used with Agastache (Huoxiang), Sweet wormwood (Qinghao), Talc (Huashi) and Coix seed (Yiyiren).